Get it whilst it's hot off the press. See the Tue 5 June 2018 Applecross Advocate. Did you notice that this Applecross Advocate newsletter came to you via a new email? 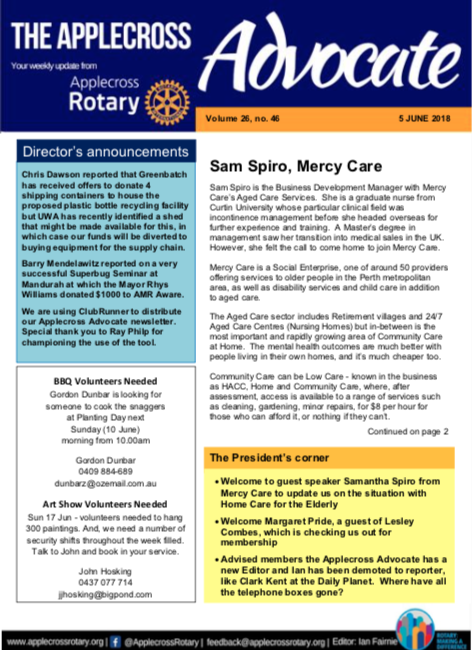 We've centralised the newsletter distribution into ClubRunner. PE Ian Fairnie will have his hands full when the new Rotary year starts. He will stay on as a freelance journalist covering some of our events. Do you have a Rotary story you want to share? Contact Shauna at 0435 089-797 or email your story to her at info@smk-writer.com.